Friday was my birthday, so I thought it was about time for me to come back and post on my dusty old blog again. I can’t believe it’s been a WHOLE YEAR since my Fiftieth Birthday Journey. I’ve been reminiscing, reading the old postings, looking at the pictures, and missing my girlfriends. I’ve taken some time away from the blog to re-tool and re-focus why I started this blog in the first place. I’m passionate about relationships – healthy ones. And I hope to challenge you and support you into creating healthy thriving relationships in your own life. And I’m challenging myself along the way. I’m working on a project with my coaching practice that I’m very excited about. I’ll be sharing that with you in the coming weeks. But for now, let me tell you about my great birthday massacre. It all started in March. 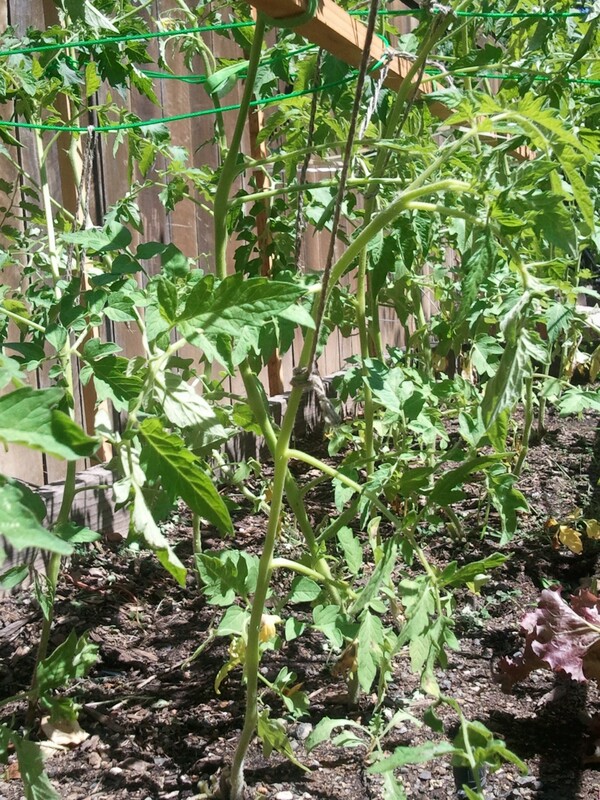 I had decided to try growing my tomatoes from seed this year – to see what might happen. I followed the directions on the seed packets – well for the most part. I made holes in the soil about 18 inches apart and dropped a few seeds into each one and covered them up. 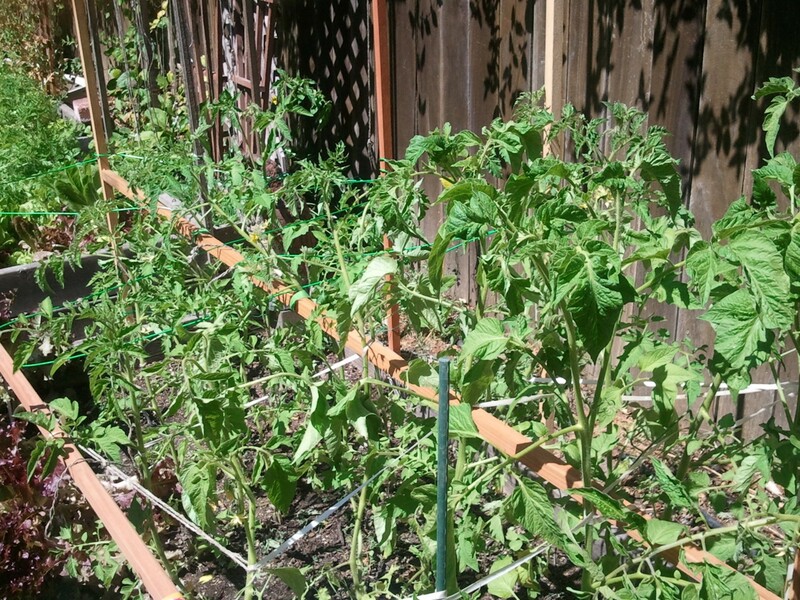 Now, the directions on the seed packet say to thin the tomatoes once they get to be a few inches tall. We’ve had a strange spring with lots of cold late rain. And when it finally got nice out, I had other plans on the weekends…. So with all that rain, followed by beautiful sun, and in really good organic soil, along with some neglect on my part, my tomatoes took off. Tall and beautiful and compacted together in the bed like one giant tomato bush. Without a single tomato. Notice the chopped off nubs. They had become enmeshed with each other. They didn’t need structural supports like other tomatoes do, they had each other. Clinging tightly together, their leaves shaded each other, preventing the sun from reaching the lower leaves. 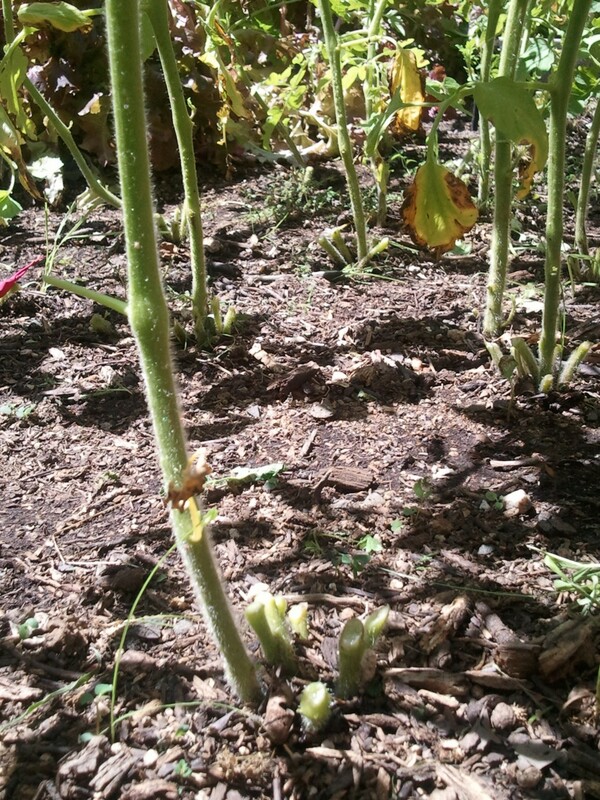 Their roots competed for nutrients from the soil, and their top stems stretched to find whatever sun they could catch. There was no energy left to make any fruit. Steve, bless his heart, enrolled our dear friend, and master gardener Richard, to come over and help. It was my birthday present! Richard handed me clippers and said for each of the tomato groupings, I needed to pick one to save and cut the rest off at the root. Oh the humanity! The agony. Cutting off healthy tomato stems and casting them in the compost heap! It was a tragic massacre. By the time we were done, my poor garden looked sparse and pathetic. The plants that were left were too weak to stand on their own and needed immediate support. The stems were long with scrawny spread apart leaves. Steve and Richard worked together to build supports for the plants, and I tied them up carefully. Now each one has something solid to cling too. There’s room around them so the sun shines on the lower reaches and air circulates around them. I realize now how emaciated my poor plants had become. Each individual plant needs its own external Frame, its own access to the sun and soil, or it will never produce fruit. Made me think about relationships in my life. I have been in relationships, heck in a whole community, that was so enmeshed together that we had each become like those emaciated plants. We looked great together from a distance, but look at us closely as individuals, and we had become too week and frail to stand on our own, and we bore very little fruit. How healthy are your relationships? Are you so dependent on each other that if one of you moves the other will fall down? OR do you each have something that individually supports you? Your own faith, your own sense of self? Do you give each other enough space to receive the warmth of the sun and the nourishment of the earth? Not sure? Take a look at the fruit. If you are each thriving, there will be fruit. Don’t see fruit? Consider what boundaries need to be negotiated into your relationships so that each of you can begin to thrive. Healthy relationships encourage us to dig our roots deep and open to the source of our nourishment directly. They don’t make us dependent; they make us strong and fruitful. Rebuilding Community. Let the sunshine in! I enjoyed reading your blog. Very true about relationships and the garden story is such a good metaphor to remember the truth conveyed here. Thanks Kristyne. I find lots of truth and metaphor in nature. The heavens declare…. — That’s my daughter (& son) and I’m proud! You’re always such an inspiration. Very good Fawn. I so enjoyed the analogy with the tomatoes. Thanks Roy. I’m always inspired when I’m in my garden. Guess I’ll have to start writing what’s there! I’m hoping my tomatoes will flourish in their newly aired out digs. It’s now a tomato hospital – but hope springs eternal. We’ll see about the fair. And yes, your saying is true. Love and miss you too.